Waid starts this series with a bang by having Daredevil bust up a mob wedding while trying to stop a kidnapping. It sets the tone for the latest Daredevil title. Waid connects it to the many years of the darker, realistic take that dominated the series for many years but takes it in a different direction. 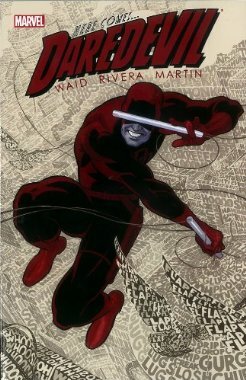 It reminds me more of the original stories where the character was a little more lighthearted and definitely more of a “daredevil”. It is a fun take with innovative art. The darker tone has dominated the title since the original Frank Miller stories. The only exception I can remember was the short lived Karl Kessel stories where he brought back the feel of the early issues. It is a title that reminds the reader that comics can be fun while telling serious stories.